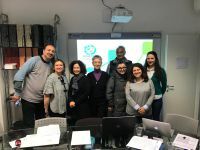 The Consortium was present at Scuola Centrale Formazione (SCF) in Bologna on February 1 st for the 4 th Transnational Partner meeting session of the project ENSEMBLE – Expectations and Non-Formal Skills to Empower Migrants and Boost Local Economy, co-founded by the Erasmus+ Programme of the European Commission. Ensemble aims to map training needs and develop innovative tools to improve the skills of migrants in Key Competence 7 – “Sense of Initiative and Entrepreneurship” in three fields: Tourism/Catering, Manufacturing, Constructions, involving 200 migrants and 150 educators at VET level. The Ensemble NFIL – Non-Formal and Informal Learning mechanism – uses media, e.g. pictures, videos, sequences of images, allowing educators to identify migrant areas and degrees of competence. Moreover, it allows educators to profile migrants’ professional skills set, in order to direct them towards the most suitable VET offer (custom solutions) for employment. At the meeting, all the 7 partners from 5 countries (Belgium, Macedonia, France, Italy, Spain) representing VET institutions, NGOs and Research Institutes dealt with several activities, i.e. overview or possible issues for the implementation phase as well as recognition of learning outcomes of the trainers, cross-cultural alignment tools, multimedia skills dashboard. Schedule of timetables and deadlines were also discussed for the project’s further development.